page 60 - into the sunset (16.jul.2012) | show comments! aaaand that wraps it up, guys. 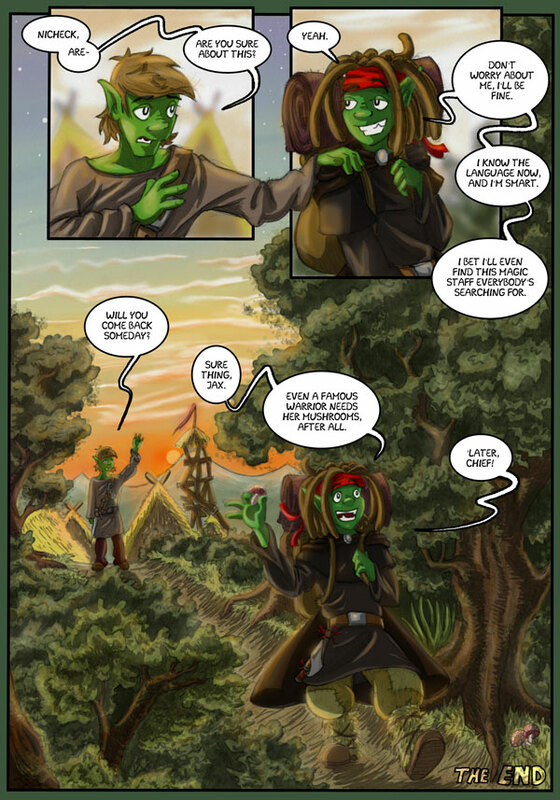 thus ends the story of nicheck, the adventuring goblin. it has been a lot of fun drawing and experimenting with the story, but i'm ready to move on to something new. the most important thing i learned from this project (besides drawing hands and feet) is how NOT to go about something like this. i guess you CAN make a webcomic without a concept or written-down storyline and just make it up as you go along, but it definitely isn't the best way to do it, and it won't make you happy in the end. honestly, i have no idea. i'll probably leave the site as it is for now, and once i've decided on which project to start next, i'll put up a new site on a different subdomain snd add a link at the front page. be assured there will be more comics in the future, probably with a different setting and maybe drawn in a different style as i try out new ways to draw and tell stories. so if you're interested in other stuff drawn by me, you can either stick around and wait for something to happen or drop by next year to see if i've come up with something new. until then, thanks for reading a gobo's life! nothing new. extra early update - 'cause i can. the page was done, so why wait and delay the inevitable?